Like a classic family egg hunt or a Cadbury Crème egg, this list of names is full of Easter goodness. From favorite candies to Springtime, we have gathered up a selection of ideas fitting for the dog born in or around the months of March and April. Common holiday associations provide a strong base for our collection. Parade is an option taken from the festive strolls that are popular holiday occurrences across much of North American. Perhaps the most popular is the Fifth Avenue parade in New York City which has been going on since the mid 1800’s. None of the parades would be complete without the celebrated donning of new clothes. Bonnet is a suggestion taken from the most notable of Easter attire. For children, the majority of the focus turns to the beloved egg-hiding bunny. Peter is a name borrowed from the most festive and well-known of Easter rabbits. Peter Rabbit was first introduced in the novel ‘The Easter bunny that Overslept’ by Priscilla and Otto Friedrich. In 1971 a television adaptation entitled ‘Here Comes Peter Cottontail’ helped to increase his exposure. As Easter Sunday approaches stores begin stocking their shelves with the treats we have come to know and love. Cadbury, Peep, and Reese are ideas borrowed from some of our favorites. Any fans of the classic Peeps must try the newer Milk Chocolate Covered variety. With the holiday comes Springtime. Temperatures rise, rain falls, and the flowers start to bloom. Names of flowers like Daisy or Lily are particularly trendy during this timeframe. Rain, Puddles, and Stormy are a good fit for those with a more shower filled Easter. Other general name ideas include Sunday, Basket (where else will you put your eggs? ), and Pastel. Some of our pages will contain a subcategory. A subcategory is a slightly more specific grouping than the main topic of the page. For a subcategory, we will include a separated table of names and corresponding descriptions. An example of a subcategory of Red Dog Names would be 'Dog Names Inspired by Red Wines'. 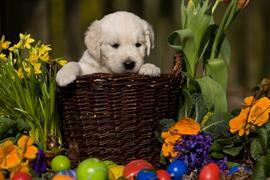 If you have any subcategory ideas for the Easter Dog Names page, we would love to hear them. Use the form below to submit your ideas.